We are pleased to announce that South Santee Aquaculture Inc.'s AlgaeControl.US division has now officially joined forces with Sonic Solutions, LLC. to bring you earth's most sophisticated and effective algae control solutions, ever! Now with more effective ultrasonic bandwidth and frequencies generated than any other device on the planet. Bandwidth is 150% greater and the number of frequencies is 350% more than our nearest competitor, made possible by programmable response technology. 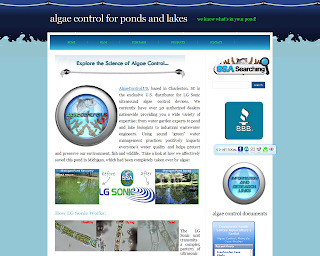 SonicSolutions, LLC and AlgaeControl.US now have the state of the art benchmark device. You can also follow us on Twitter for updates and specials. Thanks to all of our customers and friends for all of your support and business. 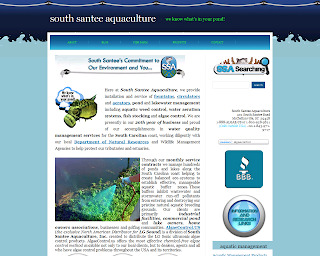 South Santee Aquaculture Has a Whole New Look! Much has happened here at South Santee Aquaculture since I posted last week. Our site has an entirely new look and so does our blog, as you can tell (if not reading via RSS). We would like to know what you think! Feel free to contact us regarding any of your pond management needs or questions about algae control techniques. Below are a couple of screenshots of our new site (designed by Justin Farrow of Neighbor Design). Don't forget to visit us at SouthSanteeTV! I contacted Rick Eager, Sr. Fisheries Biologist at Swimming Rockfish Farms Division of South Santee Aquaculture on May 7th 2008 about algae problems in 2 ponds. He advised me about using Tilapia to control it. Our community association has 2 ponds located on Little Oak Island, Folly Beach, SC. One pond was absolutely choking with filamentous algae and the other was about half covered. South Santee Aquaculture stocked a mixture of 200 Nilotica and Aurea Tilapia in each one that very day. The fish appeared healthy and vigorous. By early June the second pond appeared much improved and by late June, the first pond looked Fantastic!. I would advise anyone with similar aquatic problems to contact this company. We are very pleased and impressed. It is with great pleasure that I HIGHLY recommend South Santee Aquaculture for the stocking of any fish pond. Having been recommended by South Carolina DNR, I found them very helpful and efficient in what they do. My pond was stocked with large mouth bass, shellcrackers and bream. They arrived in a large truck with ample holding tanks for transportation. Since it was August with temperatures in the 90's, this was important. All fish seem to be doing quite well. We look forward to having a lot of fun fishing next year and watching these grow into monsters. Today, I am going to compare four different types of circulators for ponds and lakes. As you will see, some of the main differences can be found in the amount of thrust that each circulator creates, the capable voltage in each unit, etc. To purchase or if you would like to discuss pricing and financing, feel free to contact us. quickly grab soil for instant impact and effectiveness. Wetland Carpets wil inhibit weeds, improve fishing and provide a wildlife habitat. Floating wetlands add color and beauty to your pond. Aquatic plants remove excess nutrients and eliminate 2-5 times more pollutants than soil based plants. Floating wetlands also inhibit weeds, improve fishing and provide a wildlife habitat.